Penci Design, one of Themeforest.net’s elite authors, developed Soledad, his first premium news theme. 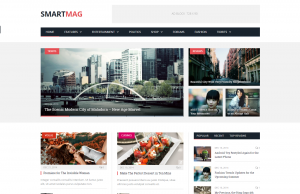 It is a nice looking template for magazines and blog websites, easy to customize with interesting project portfolios. 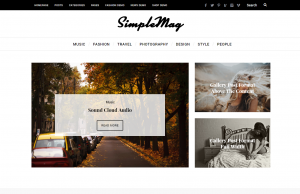 This theme comes packed with numerous pre-made demos and is good for building magazines and blog websites. Soledad comes with two mega menu styles, three sidebar layouts, sliders and templates allowing you to create beautiful pages & posts with distinctive typography. You can easily customize your homepage, by choosing one of the 25 Homepage Layout models. Also, there is an option to customize the looks of the Category, Tag, Search, and Archive Layout. This theme is fully responsive, so it looks good on all devices, no matter the screen size. If you want to get an idea of how content will display on your website, you can import one of the 40 beautiful pre-made demos. To do that, you will need to install a free plugin called the Penci Soledad Demo Importer that comes bundled in the theme’s files, along with other dedicated plugins. It only takes a few clicks, and you can preview your site. Soledad provides an attractive option: you can set a featured video with sound as your website’s background. Also, it has a feature called Portfolio content type, allowing you to create beautiful image galleries and to organize your projects using a masonry or grid layout. To create portfolios, you have to activate the Penci Portfolio plugin. You can illustrate your work using different page layouts. This template has three sidebar styles – left, right, or no sidebar – and you can add widgets on them using the drag and drop functionality. Soledad comes with two magazine homepage layouts and for the articles, you can choose between masonry or grid style. Also, you can choose the category and the order they will be displayed in. You get four distinct gallery lightbox styles to display photos. A justified gallery can showcase plenty of images, structured in columns while the single slider gallery loads images one by one using an elegant lightbox effect. The Masonry and Grid options can display your photos in up to 9 columns. Soledad has 30 Featured Slider types, and two custom Penci slider styles, powered by the Penci Slider plugin, you can use to catch the visitor’s eye. The author also designed four content body templates and a mega menu option that makes a higher visual impact on your audience while containing a small website posts summary. Soledad allows you to enable or disable your options in real time, through the Theme Customizer, and all your adjustments can be seen live on the page’s right side. The customizer has 34 tabs with different customization options, from General Options, social media, colors, footer options, and everything in between. This template brings you a bundled free license for the Visual Composer page builder plugin. After you install it, you create pages on the backend or frontend of your website with ease. Visual Composer has 72 different elements that can be inserted into rows and columns on your page. You can help your visitors reach the most relevant articles while displaying custom widgets on the sidebar. Soledad comes with 11 widgets that include Popular Posts, Social Media, Quote, Slider, and others. The theme comes with eight free optional plugins recommended by the PenciDesign developer. Some of them are Penci Recipe, Portfolio, Slider, and they bring additional functionality to this theme. The Demo importer plugin is a useful tool, as it allows you to import one of the 40 theme’s demos and create a website for your personal needs. If you want to create an online shop, you’ll be glad to know that Soledad is compatible with WooCommerce, so you can start selling your products. The template is also compatible with popular WordPress plugins like Contact Form 7, MailChimp and WPML. It is Search Engine optimized as well. We have tested the Soledad theme’s default demo on different page speed tests, and it loads the content with good speed. Soledad is a magazine theme designed to behave like a multipurpose one. The theme has a huge number of different layouts and settings, but it isn’t well optimised for blogging and this may cause a beginner some headaches. The template comes with a documentation, but it lacks the Search Option to help you find the information quickly. Launched in November 2015, Soledad theme lets your news ideas creatively color your website. It's relatively easy to use even for beginners and doesn't require coding skills. In time, as the author will improve it, Soledad may become a very popular theme for blogs with stunning image galleries and sliders.